To honour the traditional recipes handed down through generations of her family, owner and gelato maker Sandra Foti wanted a space reminiscent of where they came from. 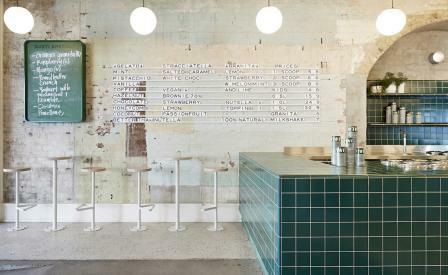 As a result, the interior of Piccolina Gelateria, located in the Melbourne suburb of Collingwood, is inspired by similar establishments in 1950s southern Italy. Local interior design firm Hecker Guthrie installed a five-metre-long pozzetti counter inset with 24 stainless-steel containers to house the frozen desserts created daily. Emerald green tiles surrounding the bar give the space a hit of colour against the partly exposed brick walls. As they were stripped back, layers of paint in colours including green, cream and brown were revealed, and these were used as a basis for the palette. The former pawn shop revealed some other stunning original design features, including a stone arch, terrazzo floor and pressed tin ceiling, during the renovation. All were restored. The final, sculptural touch was a series of large, frosted pendant lights hung in linear fashion. Customers can perch on high stools at the back of the store to peer into the kitchen where fruit is pureed, nuts roasted and cream churned in Carpigiani machines to make the labour-intensive offerings. There are 20 regular flavours, including four vegan ones, alongside four changing varieties – this past Australian summer has seen mango alongside ricotta and lemon curd – and a selection of granitas.